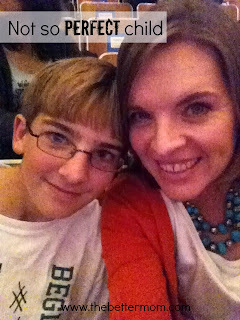 Oct 28 A Not So Perfect Child & Better Mom Mondays Link-up! It took me a long time to get pregnant with our first child. It was 4 years before "we" got pregnant. I remember how shocked I was to find out that we were having a baby. It was a long and not-so-pretty pregnancy with a long and not-so-pretty labor and c-section to finally have that baby boy. He was precious. We celebrated our fifth anniversary just a few weeks after he was born. Adam was a particularly difficult baby. I remember days when he would scream off and on all day and I would just stick him in his crib and close the door for a little bit. I couldn't bear it. I couldn't seem to console him about whatever that constant back and forth screaming was. He began showing peculiar things about him - he would line up cars and then move them again wherever I went but never really played with the cars. He would turn trucks over and watch the wheels spin, but never play with the trucks. He would scream and throw an absolute tantrum if he saw a ceiling fan moving without the light on. How odd, but we just thought "that's Adam". He didn't talk for along time, never pointed at items...the list goes on. Once he started talking, he would suddenly lose words - how do you lose words? In the end, we found out he had autism - at 2 years and 10 months old he was officially diagnosed. We could hardly believe it. But God was so gracious - he gave us the grace and we never had this "grieving" we heard so many people talk about when they have a special needs child. He showed us that Adam was still the same child he was before, we just needed to begin working harder at what we had started. God showed us we needed to be content with this son He gave us. We were the chosen parents to raise this boy. I had to be content to look at my friends' children and think "if Adam could only talk like that" or "you have four boys and none of them have autism -- do you know how your odds are stacked up against you?" and "if he could respond to people the way my friends' kids could...." Well, it's easy to compare when your child is behind. Far behind. There were days that I thought we'd never know what it was like to have a typical child. Do you know that I would never desire that now? Wow, has Adam shown us so much -- taught us so much patience. He is not like other kids - and I'm so thankful. He has grown into an amazing teenager. He's kind and compassionate, responsible and intelligent. He has never once asked us if there was anything wrong with him or if he was different - he doesn't even realize that he has autism, not because we aren't willing to tell him but because we have talked with him about how God has given each of us strengths and weaknesses. When he asks, we'll tell him more and he'll have an amazing testimony. But, for now he understands that certain things are a little harder for him, but other things are easier! Who's child IS perfect? Why must we have this yearning to have a typical child? We must be content with the children God gave us, raise them as He has told us to, and love them unconditionally. I would never change the child God gave us. God has taught us to be content in this...and through this is teaching us contentment in many other areas of our lives.